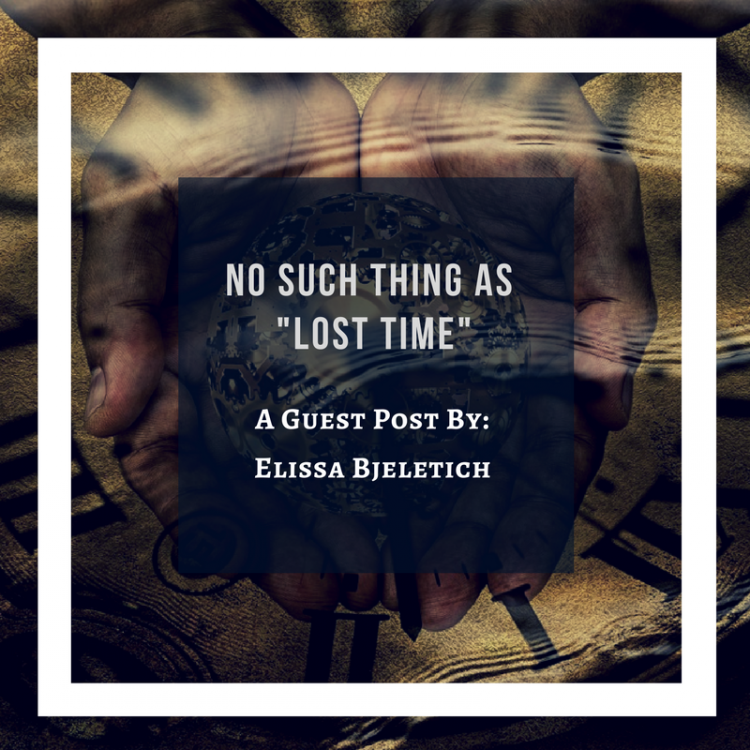 Today, I’m handing things over to my friend Elissa Bjeletich to follow up on the podcast episode we recently co-hosted about time during seasons of illness. Elissa’s story is perceptive and encapsulates what I think a lot of us go through when we suddenly find the course of our lives veering off into a trial we never expected to face. May this encourage all those who find themselves in times of waiting and sickness! As I write this, today is the seventh anniversary of my daughter’s liver transplant, and after my conversation with Nicole, I am being drawn back to those days in the hospital again and again. I keep remembering how intensely I was feeling time and thinking about what time is and how it impacts me. On the one hand, there was my lost daily routine; I was thrust into someone else’s schedule, forced to live on hospital time with its rhythms that were so foreign to my own. Those months were a shock to my system. It also felt like we were living on God’s time, because we could really feel God at work and we were so aware of how we much we relied on Him. Perhaps because we couldn’t accomplish anything ourselves, it became more clear that God was orchestrating so many of the things around us. 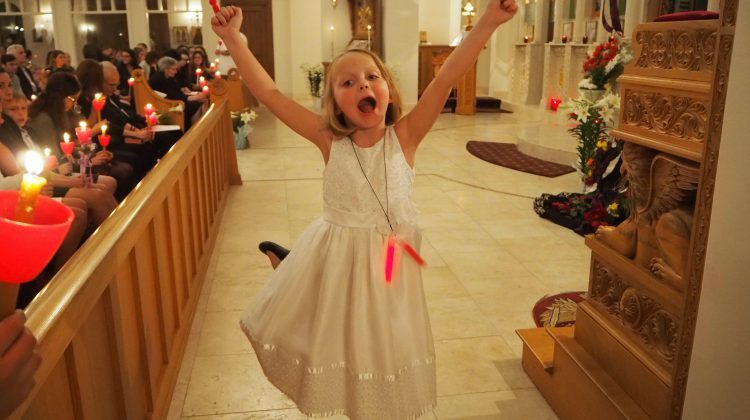 I could not control the wait for an organ, and later I could not speed up my daughter’s very slow recovery, so I was forced to learn how to sit back and let God’s time unfold. Mariana was marked for death, born with this terrible terrible liver, and perhaps we will lose only a few months of her life. It could be so much worse. How will it affect her that she spent weeks asleep? She’s practically unconscious with all the sedation they give her. Will she feel like she missed weeks or like she was alone for weeks—or will she not even know she missed all this time? I would love to think she is spending time with the angels or something, but considering the lousy mood she’s in whenever she begins to wake up (if you can call it that), it seems unlikely. No, I think time is just passing without her. She’s checked out, and when (if) she comes back in, she won’t even know what she missed. (Thank God, because what she’s missing is lousy!) So I guess what I’m thinking about today is lost time. We’ve lost a week of progress, and I wonder how many weeks of this child’s life are lost. That’s not to even touch on the precious weeks of my other children’s lives I am missing—although they, thank God, are growing and living happily. Of course, there’s not really any such thing as lost time. There’s the divine eternal, eternal, and then there’s this funny ticking of clocks here on earth. We measure time and spend time and waste time and lose time, and we have only so much time here in our earthly lives. Our days are numbered, so we have to think about what we do with our limited time. We’ll answer for it one day. Mariana in the hospital seven years ago. My time in the hospital with Mariana was a fruitful period for spiritual growth — even if growth feels like an agonizing lesson in how to increase in patience. I called that hospital room ‘my monastic cell’ more than a few times. 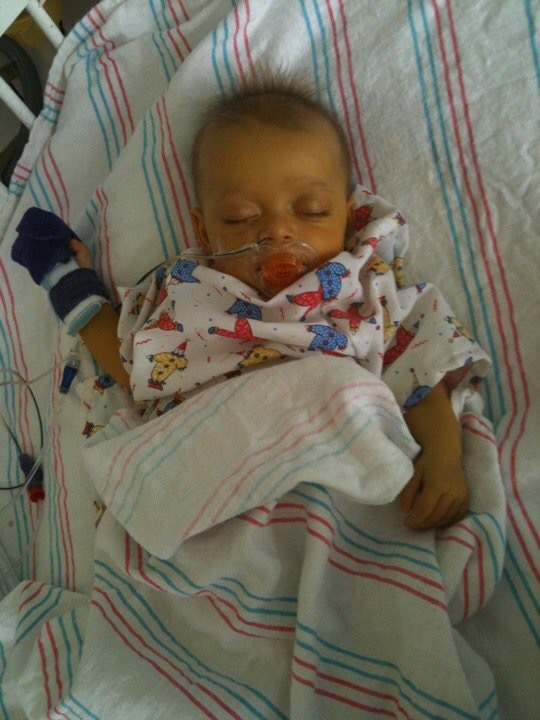 Mariana’s recovery took so much longer than I thought it would; it inched by ever so slowly. Through trial and error, I found that the way I thought about time made all the difference. If I could live in the moment without measuring our progress, I was good. If I could simply trust in long-term progress (this child almost died but will be healthy and normal in a couple of years, or as her doctor would quip, “she’s on track for Prom!”) and allow myself to live in the moment without concerning myself about how we would get there or how long it would take, I could hold onto the peace God had sent me. On the other hand, thinking about our daily progress was like letting go of the rope that held my anchor — I could spin out miserably into the abyss unless I held tight to that anchor. Moments like that, I think, were a true entry in God’s time. I could only find that peace which surpasses understanding when I was shielded from linear time and thus protected from concerns about “how much longer” this could last. 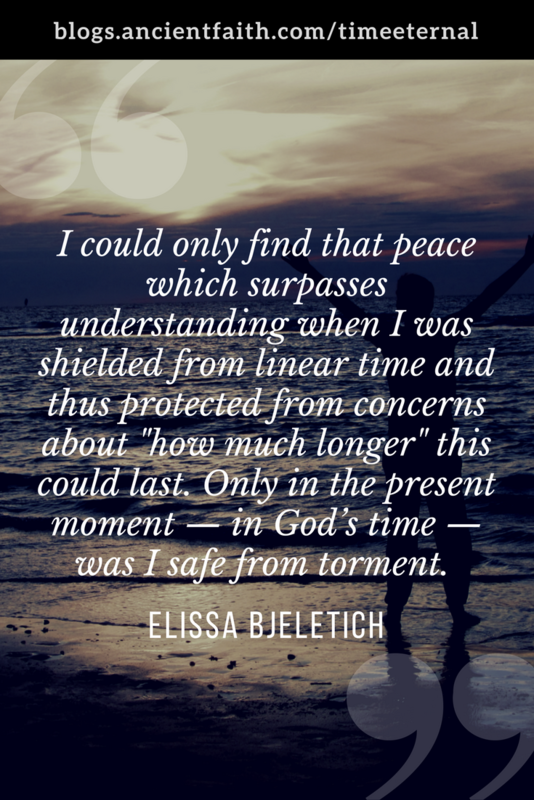 Only in the present moment — in God’s time — was I safe from torment. Entering into that mode of time/ eternity required only that I rejoice and give thanks; and as long as I stayed, there was peace. Elissa Bjeletich writes and speaks on topics of Orthodox parenting and religious education, and has published several books including the co-authored Blueprints for the Little Church: Creating an Orthodox Home, In God’s Hands: A mother’s journey through her infant’s critical illness, and Welcoming the Christ Child: Family Readings for the Nativity Lent. 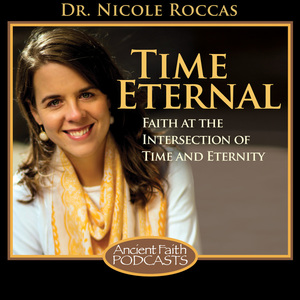 She writes the Ancient Faith Radio podcast and blog Raising Saints. A wife and the mother of five daughters, Elissa works in the Sunday School and Youth Ministries at Transfiguration Greek Orthodox Church in Austin, Texas.